A discounted Family Dollar gift card will save you money on your entire purchase. With departments in auto, baby, celebration, cleaning, electronics, family, food, seasonal, holiday… okay, I could go on and on, but you’ve probably been there already, so you know what they carry. Everything. They carry everything. And for less money than you can find anywhere else. An American variety store with over 8,000 locations across the United States, they carry everything you can imagine- in the brands you trust- for less money. Now, just imagine how much more you’ll save when you purchase a Family Dollar gift card? What’s more, because gift cards are a form of currency, all coupons remain valid! Make sure you check out their weekly ads or go online for printable coupons so you can save even more money on your next shopping spree! Founded in 1959 in North Carolina by a 21-year-old named Leon Levine, this store has become the go-to place for just about anything involving health & beauty, family, home, school, and pet. If you’re on a budget, or just looking to save some money, then this is the store for you! And just think of the additional savings you’ll get if you buy a discounted Family Dollar gift card. Don’t forget; gift cards make super presents too! 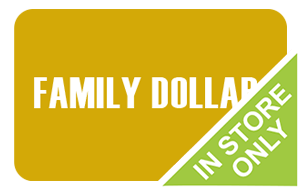 When you purchase your Family Dollar gift card, you’ll get more for your money! That’s right, more of the brands you know and love, for less money out of your wallet! And that’s not all! Cards2Cash offers gift cards for many other stores- saving you money every day! Make sure you check out our listings for Dollar Store, Dollar General, Dollar Tree, Five Below and more! Cards2Cash makes it possible to save money while shopping in stores you love! Do you have a Family Dollar gift card you aren’t going to use? Cards2Cash will buy your unwanted gift card and pay you the highest percentage rate possible. We buy unwanted gift cards for gas stations, retail stores, restaurants, and more. Visit one of our retail locations for on the spot payment OR simply fill out our online form and we’ll get back to you with an offer for your unwanted card. With Cards2Cash, you can say goodbye to your money troubles!